What most patients don’t understand is that sciatica is the name of a symptom. Sciatica can be defined as pain down the leg or numbness down the leg. The key to treating sciatica is to identify the cause. There are 5 causes of sciatica and when your treatment matches your cause you will get improvement. To understand spinal anatomy will help to better understand the 5 causes. So a quick review is necessary. The spine is made of 24 vertebrae in between each vertebrae there is the disc. 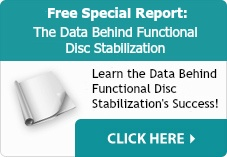 The disc acts like a cushion and allows for motion of the bones (vertebre). In between each vertebrae there is a nerve that exits directly off the spinal cord through an opening we call the foramen. It’s in this area that we see 4 of the causes of sciatica. When the opening is compromised, meaning some thing is causing it to be smaller than normal, then you will very often have pinching of the nerve. So the question is what causes a compromise of the foramen tht results in the pinched sciatica nerve. 4 Reasons for compromise of the foramen. The 5th cause is the easiest to treat because it’s muscular based. It’s called piriformis syndrome. The nerve gets pinched by tight muscles the most common tight muscle in this situation is the piriformis muscle. When you get the muscles to relax you get better. The problem is 90% of all treatments you get, at conventional chiropractic and physical therapy, for sciatica is treatment for piriformis syndrome. This is an issue because only a small percentage of sciatica is the result of priformis syndrome. So if you have sciatica and it’s not going away it because you didn’t have the proper treatment. I have said this many times when you have a pain and you’re getting treatment and you’re not getting better you are not getting the proper treatment. So if you have sciatica and it’s not going away you need to identify the cause and get the best treatment for your cause of sciatica. Call Now 855-290-6400 for a Free Consultation! Also Sign up for our Sciatica Relief Center.